At Heuberger Subaru, we take our town's military history seriously. Being surrounded by multiple military bases, we see firsthand the sacrifices that our brave men and women continue to make for our country and our freedom. We're proud that almost 50,000 military personnel call Colorado Springs home, and we're excited that we get the opportunity to provide them with the VIP treatment they deserve. 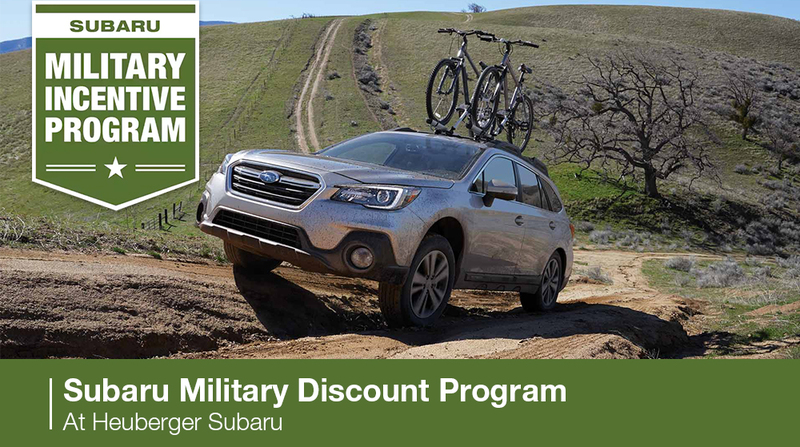 At our Subaru dealership in Colorado Springs, CO, all active-duty members of the U.S. Air Force, Army, Marines, National Guard and Coast Guard qualify for our Active Military Discount Program. With our Subaru military discount, you can save anywhere between $1,300 to $3,300 off the MSRP* of your favorite Subaru model. Whether that be the new Subaru Outback or stunning new Subaru Forester, you can take home the Subaru crossover or sedan of your dreams for one incredibly low rate. And best of all, our other Subaru incentives and offers can be applied to this discount to help you save even more in the process. It's our pleasure to bring this exciting military offer to Colorado Springs, and we hope that every military family takes advantage of it. You and your family have played such an influential role in our economy and community, and now we feel it's our turn to say thank you and treat you to the first-class car-buying experience you deserve. We look forward to helping you buy or lease a new Subaru soon! *Your discount depends on the Subaru model and accessories you select. MSRP does not include tax, title and registration fees. Specific models may be excluded. All other models are subject to availability and retailer discretion. Limited time offer subject to change without notice. Terms and conditions apply. Prior sales excluded. This offer replaces all existing offers. Valid in the U.S. only, except Hawaii. Cannot be combined with any other SOA promotional offers, coupons (such as auto show or internet coupons) or direct mail offers (except Subaru Guaranteed Trade-in Program (GTP), $500 Subaru Added Security®Maintenance Plan Coupon or Subaru Reward Dollars).